Congratulations on your condition! Be certain to start gathering your childbed linen right away! Remember, everything, including thread and textiles, is made by hand and unmechanized ground transport is the only option for getting items brought to you. If you require anything from London, and you don’t live there, you may need to leave enough time to write to a male friend or relative who resides there, or appeal to one who may be undertaking the journey for other reasons, to make your purchases for you. The first article you will put on the babe will be a shirt. This is made from linen, but depending on your finances you may opt for a high quality diaper weave, or settle for a course plain weave. If you are strapped for resources, you may choose to make a shirt out of a single piece of linen, perhaps cut from an old shift of your own. Just make cuts in from the sides of your rectangular piece, fold the body halves toward the front, fold the top of the resulting T down to meet the body halves across the chest, seam across that join, along the bottom of the resulting sleeves, and down the sides. Then widen the neck opening a bit and you’re done. For a higher quality shirt, you’ll still fold your piece of linen in to the front opening, but you can seam the shoulders, and inset shaped sleeves. Feel free to add a collar, lace insertions to the seams, embroidery, and lace edging wherever you fancy. Although you won’t change anything about the structure of this garment, you can call it a shift instead of a shirt, if you want to stress that your babe is a girl. You’ll definitely need clouts (also called double clouts or tailclouts) to cover your little one’s bottom. This is simply a doubled linen cloth. Baby care expert Jane Sharp (1671) reminds you to “shift the child’s clouts often for the Piss and Dung.” Especially at night it’s a good idea to place a flannel square, called a pilch, over the clout for extra protection. Once the shirt and tailclout are in place, you’ll put on a bed. The bed is a cloth which goes from the infant’s chest to below its feet. You’ll wrap it around the babe’s body, and be sure to fold it up over the feet. Infants’ feet need to be covered for most of the first year of life. Flannel barrows are trendy new items that may be used in place of the bed. They are shaped at the waist with vertical pleats, and the back opening fastens with ties. If you choose to use a barrow, you must still turn it up to cover the feet. You’ll want to place a piece of cloth under the babe’s chin to catch dribbles. You can use a bib, specially made for the purpose, which can be variable in length. Alternatively, you could just use a folded blanket. A larger version of the bib is a pincloth or pinafore. Remember that keeping the infant’s head warm is extremely important. A good option is to start with a cross-cloth or forehead cloth. This is a band or triangle of linen placed, as the names suggest, across your babe’s forehead. Over this you will place a biggin, a style of close-fitting cap. It might be wise to put another cap between the cross-cloth and the biggin. Or you could just use two caps. A hood could be placed over the biggin. Staybands or long stays not only cover the babe’s head, but have long side pieces which may be pinned down on the shoulders. This will keep the infant’s head in position. You have some choices, as long as your little one’s head is well covered by two layers at the very least. Buttons and hooks are not used on infant clothing (and snaps and zippers do not exist), so all layers will be tied or pinned in place. Don’t worry, you can use the same pins that you use to keep your own clothing in order. Now for the all-important swaddlebands or swaddling bands. These narrow (perhaps three inches wide) bands may be made of wool or linen. Begin wrapping the babe in oblique circles from the chest, working down towards the feet and then back up again to the waist. The binder, swathe, roller or belliband is a shorter version that is gaining popularity. Wind this broad band two or three times round the babe’s body from the breast down over the navel. Our expert, Jane Sharp, advises that, when swaddling, care should be taken to “be sure that all parts be bound up in due place and order, gently without any crookedness … for infants are tender twigs and as you use them, so will they grow straight or crooked.” To this end be sure that the infant’s arms are placed straight down its sides. Since you will be undoing this periodically throughout the day in order to clean the babe, switch its tailclout, and allow it to exercise its arms, be sure that you rewrap with equal care each time. The child’s arms may be permanently loosed from swaddling anywhere from seven weeks to four months, but remember to keep the babe well wrapped from breast to feet for around a year. This will keep it warm, keep the lower limbs straight (and keep your little one from the many household dangers like open flames and sharp objects.) We have heard that some children are being taken from swaddling completely at as young as four weeks, but we regard this with concern. Now, if you are of the common sort, you may not have the wherewithal to swaddle properly. At least use a supporting band to hold the layers of cloths in place, and be sure to wrap the babe well in blankets. Linsey-woolsey, with it’s linen warp and woolen weft is strong and cheap, and four or so blankets made of this should suffice. Even the well-swaddled babe will need to be covered in outer wraps. Blankets will do if you cannot do better, but a bearing cloth is more grand, and is advised for the christening. You may choose to have yours made of silk or satin, perhaps decorated with silver lace. We’ve heard of a woman who had one of crimson damask worth 25 shillings. Being so valuable, you will probably want to keep it for your own children to use with their babes. Or perhaps your parents will leave you theirs. Coats, cloaks and mantles have a bit more shaping than blankets and bearing cloths. The mantle looks a great deal like a cloak, being an A shape with the top point removed for the neckline and having the opening along the front. Mantles may be just wraps, or they may have armholes to use once the little one’s arms are freed from the swaddling. If there are sleeves they will be separate pieces. 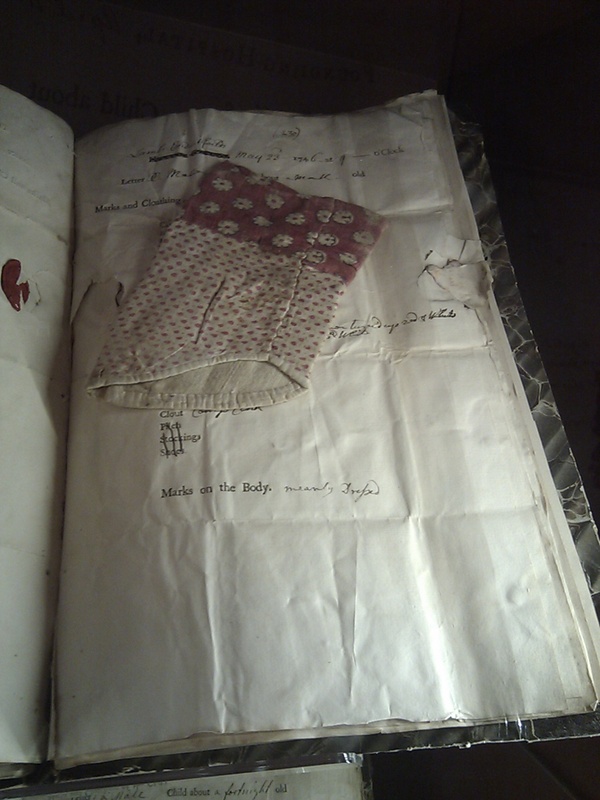 If you are planning to leave your babe at the Foundling Hospital, you may want to give it sleeves with a distinctive fabric pattern or decoration, even if you don’t have a mantle. They are often kept as an identifying token should you be able to take your babe back later. Everyday mantles will be made of linen, but if you can afford it you will want a selection of mantles, not only in different grades of linen, but in silk or satin. You can choose to have these in many colors, or decorated with lace or exquisitely patterned quilting. A splendid mantle may be part of your child’s christening clothes, along with other beautifully trimmed items, such as bibs, cuffs, gloves, and caps. We are well aware that John Locke spoke out against the practice of swaddling in 1693. He feels that warmth and restraint are antithetical to the development of the child. We would like to point out, however, that swaddling has been practiced for many, many generations to great benefit. We would also like to observe that Mister Locke is not, himself, responsible for the practical day to day care of both babes and household. Ashelford, Jane. 1996. The Art of Dress: Clothes and Society 1500 – 1914. The National Trust, London. Buck, Anne. 1996. Clothes and the Child: A Handbook of Children’s Dress in England 1500 – 1900. Holmes & Meier, New York. Payne, Lynda. “Health in England (16th–18th c.),” in Children and Youth in History, Item #166, http://chnm.gmu.edu/cyh/teaching-modules/166 (accessed June 25, 2014). Reynolds, Anna. 2013. In Fine Style: The Art of Tudor and Stuart Fashion. Royal Collection Trust, London.